When you donate money, you help us make a big difference to an animal in need. Your contribution goes directly to providing emergency medical treatment that otherwise would go unmet. You can support us with a one-time single donation, or in the most efficient way possible by making a monthly gift. Yes! I want to help save lives. 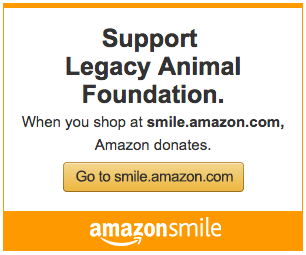 Contributions to Legacy Animal Foundation are tax-deductible to the extent permitted by law. Tax ID #46-0873159. If you have any questions about donating to us online, please send us an email.